Welcome to Japan Soaring Club Homepage ! Most people wish to have freedom of being in the air at least one time in his/her life, and there is a way: soaring. Flying without artificial power give a kind of ultimate joy that will be totally new to those who have never experienced it before. You can feel what is being aloft, what is sound of wind and what is surge of rising air, in our beautiful gliders. The JSC was established in 1952 and has been pursuing the art of soaring for more than half a century (see Club History). Today we have some 150 members. Our home base, the Itakura Glider port, is located about 90 km north of metropolitan Tokyo, and has a large hangar with a well maintained grass runway (1000 m x 60m in size). We do aerotowing only and there are no winch launching facilities.We provide ab-initio through elementary cross-country training, plus basic acrobatic maneuver lessons (optional) to members of the club. The club also organizes a one-week long Glider Private Pilot Course twice a year that is open for any. Visitors and visiting pilots are always welcome of course.Basically, we fly on weekends and Japanese national holidays. Prior arrangements are required for other days. We fly year-round, however, the main season for soaring is from February through early June. During this season, you can expect dry and cool upper air from Siberia and the Chinese continent that will make good weather conditions both for thermals and mountain waves. This makes Itakura one of the few places suitable for cross-country soaring in Japan. Due to the Pacific high system, the ceiling of cumulus clouds tends to be rather low in the summer. We focus on basic training and duration flights for the “badges” during this season. After a typhoon spell in August or September, we have a very comfortable autumn for moderate soaring conditions. It is usually very cool in middle of winter, but we do not expect any snow around the place. This enables us to run year-round. 1 x Aviat A-1 HuskyThere are many other privately owned high performance gliders at the glider port. You can fly in our two- seater gliders on any weekends and national holiday, on a weather permitting basis. Rates:16,000 yen per an aerotow launch to 2000 ft (for 15 minutes), 200 yen for each additional one minute, including One-day Membership fee (3,000 yen). 13,000 yen per 2000 ft (around 13 minuets) moter glider flight. All the flights are accompanied by qualified club pilots. To fly solo in Japan you need at least a Japanese Private Pilot Certificate or Student Pilot Certificate, plus a valid Medical Certificate. If you intend to stay with JSC for a longer period, you can consult with the club instructor in charge to convert your license into Japanese certificates. For a short visit, you should carry your logbook and licenses as well.Basically there are club members who speak English (not fluent, though) on each flying day, so you should not have any troubles on your visit, however, making a prior arrangement through our contact person (see below) is recommended. 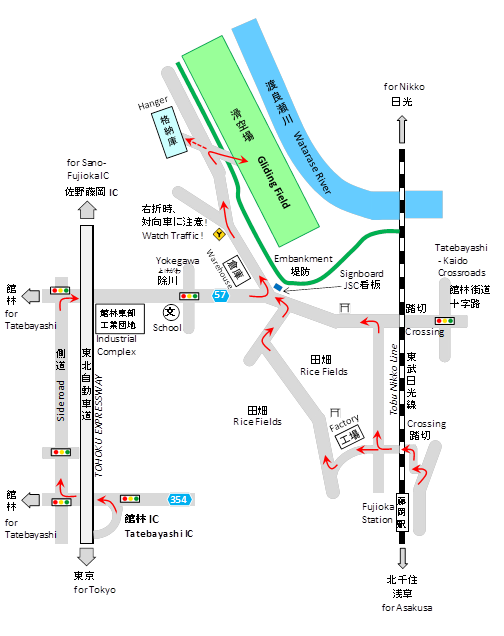 Access to Itakura by train from Kita-Senjyu station (in Tokyo) to Fujioka station by Tobu Sky-Tree line is as follows. At Kita-Senjyu, get on board Semi-Express train departing at 8:08 for Minami-Kurihashi. Then get off at Minami-Kurihashi station arriving at 9:08, then change to normal train departing at 9:09 for Shin-Tochigi. Then got off at Fujioka station arriving at 9:32.
so you could be picked up to our glider port. When you arrived at Fujioka station after 9:32, you can take taxi from Fujioka . You just say to driver “take me to GLIDER”! It takes five minutes to Itakura glider port. Get off at “Tatebayashi” exit, about 3 km after passing a long bridge. Follow the map. If there is no congestion on the road, it should be 60 to 80 minutes driving from central Tokyo.You can see the runway behind a long riverbank. You should park your car at the parking lot in front of the hangar (because it is sometimes very dusty on the runway). We have a clubhouse (attached to the hangar) with basic overnight facilities. A meeting room is also available. No bar or restaurant is provided, but drinks (lots of) and food are available in the clubroom at reasonable costs. Basic sleeping supplies is provided, but you should carry a sleeping bag if you make a visit in the middle of winter. We have a full-time secretary in our Tokyo office who will accept and handle any inquiry about the club. For weekend arrangements, you can contact the e-mail address of the contact person below. All the instructors and the tow pilots work on a voluntary basis. Twin2 / Twin3: 1,200 yen basic fee plus 100 yen per minute. Super Dimona: 400 yen per minute plus 600 yen for landing. Other gliders: by arrangements. Please ask one of club’s instructors on your visit. Membership is available to any person who wishes to fly, regardless of age and nationality. 3,000 yen per day per one person (not required if you have just come to observe). Lodging: 1,000 yen per night and some additional fee for accommodation. Address : Yokegawa, Itakura-cho, Ohra-gun, Gumma-ken 374-0101 JAPANLet’s enjoy being in the air with the wind! We expect to have many visitors on any flying day.